Please contact me with further information on Small Schools Standing Orders. We are pleased to make you a special offer to secure your requirements for 2019. By invitation only, we are offering the Small Schools Standing Order on a subscription basis. 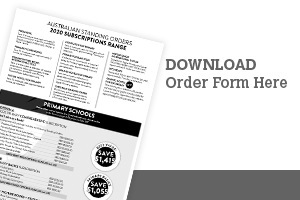 Small Schools Subscribers in 2019 will benefit from better prices (a 25% discount off RRP) and simple administration. One invoice covers the whole year's selection (four issues). For more information Click here.